That's where the processing and prioritizing begin; in Allen's system, it get a little convoluted at times, rife as it is with fancy terms, subterms, and sub-subterms for even the simplest concepts. Thank goodness the spine of his system is captured on a straightforward, one-page flowchart that you can pin over your desk and repeatedly consult without having to refer back to the book. That alone is worth the purchase price. Also of value is Allen's ingenious Two-Minute Rule: if there's anything you absolutely must do that you can do right now in two minutes or less, then do it now, thus freeing up your time and mind tenfold over the long term. 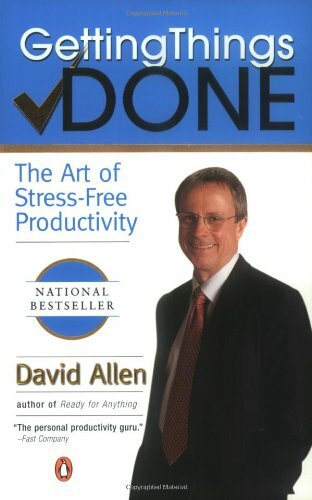 It's commonsense advice so obvious that most of us completely overlook it, much to our detriment; Allen excels at dispensing such wisdom in this useful, if somewhat belabored, self-improver aimed at everyone from CEOs to soccer moms (who we all know are more organized than most CEOs to start with). --Timothy Murphy --This text refers to the Hardcover edition. Productivity trainer and consultant David Allen offers a crash course in basic time management and personal organization. While Allen's reading is a little stiff, his enthusiasm for the topic and his passion for systems comes across loud and clear. Allen's message is concise: Organize yourself to free your mind for greater pursuits. And this simple production makes that daunting task seem possible. It's a quick glimpse at setting goals, clearing clutter, and staying focused. Allen's reading, although one dimensional, suits the nature of the topic, making this worth the time for the effort it will save down the road. H.L.S. © AudioFile 2002, Portland, Maine-- Copyright © AudioFile, Portland, Maine --This text refers to the Audio CD edition. ...one of the most influential thinkers on productivity. --This text refers to an out of print or unavailable edition of this title. David Allen's methods are key to survival in today's chaotic business climate. --This text refers to an out of print or unavailable edition of this title. If you've tried other time managers and still feel harried, take a minute to check this one out. --This text refers to the Hardcover edition. Offers a complete system for downloading all those free-floating gotta-do's clogging your brain into a sophisticated framework of files and action lists--all purportedly to free your mind to focus on whatever you're working on. Softcover. I attended one of David's seminars in 1986. As a result, I was able to successfully manage 101 concurrent projects, finishing on time and under budget. Fast forward to 2001. I keep this book by my side at all times (David publish it in Ebook form so it's easier to carry!). The company I'm with now wonders how I get the "impossible" projects done. Using David's techniques in the book, it seems like I can complete a full work day in fewer hours because I know what all my "next actions" are, and do them promptly. Gives me a lot of worry free time. This is a book you "DO" not just read. Be prepared to work when you start out, but when the initial work is done, that's when the fun begins. I cleaned my inbox and email box of 300 items in less than 15 minutes, filtering out the junk, the things that needed immediate attention, and the "someday maybe" things (like buying my first Harley). This works for my personal life too. No more missed anniversaries, birthdays, phone calls, errands, etc. Do you ever think about work projects at home? Do you ever think about home projects when you're at the office? Ever worry about that phone call you need to make or that errand you need to run? Forget it! Get the book. It's awesome. Get the book - period. If you don't, you deserve your stress. "Getting Things Done" is a book that teaches you how to do just that: get things done. If you're like most people today, you're busy trying to juggle business, family and personal items all at once, and sometimes a ball (or two) gets dropped. In this book, David Allen provides a complete system to help. The process itself, affectionately referred to as "GTD" by loyal followers, is one of the most useful I've personally found. The problem is almost universal: Knowing what you want or have to do in life is one thing, but actually moving forward with it can be a huge challenge. This is especially true for all of us that have never-ending task lists and/or large, long-term projects on our plate. Looking at the mile long task or project list can be overwhelming -- and cause you to simply not do anything at all. In this book, David explains how to break projects, goals and tasks down into single item, doable, actions. Now this is an extremely simplified explanation of the GTD process, but it is comprised of a few key items: The Project List, The Someday/Maybe List, and the Next Actions list. Integrated into these key items is: Inbox, Outbox and File Cabinet management. While all of these components are integral and useful parts of the entire system, the Next Actions list is where the majority of your productivity takes place. In short, a Next Action is the very next thing you need to do in order to move something forward. So instead of looking at a project and wondering how you'll ever be able to handle it, you simply break off a very small chunk -- the very next thing that has to be done -- and focus on that chunk by itself. Once that chunk is completed, you then break off another -- the next thing that has to be done -- and so on. I won't try to explain all of the intricacies -- David did that with over 250 pages in this book -- but I will tell you this: David's system is extremely useful and easy to learn. You can start reaping the rewards of "Getting Things Done" before you've even finished the book. I've also found it very handy to keep on the reference shelf for further consultation as I'm refining and customizing my own enhanced productivity system. I am a fan of practical, informative books with examples -- this one really fits the bill and I highly recommend it. I own a small business and this book has literal changed my life. I've bought copies of the book and Cds for all my employees. I have set up my files and Outlook Email to follow Dave Allen's system which is more workable than any other system I have tried. I like the term Psychic Ram Dave uses describe things we fill up our minds with that result in frustration and keep us from creativity and priorities. Dave has you begin by collecting everything that comes your way (for business, education, personal, etc) in to an inbox (or container be it computer or physical inbox). Being a business owner and homeschool mother I appreciate Dave addressing business and home issues together. 1. Do it (if requires less than 2 minutes). 3. Defer it (by calendar item or Next Action). 4. If it takes multi actions it goes into a Projects. Everything is kept in a tickler files for quick review. Once the system is set up thing flow very smooth by continuing to file in this manner and reviewing tickler files weekly (It is critical to spend one hour a week on these review sheets for the system to work). I first listened to the CD by Allen "Ready for Anything: 52 Productivity Principles for Work and Life." It is also excellent. I have listened to all Dave CDs numerous times and still get quality ideas. I love this book. I have carried it in my briefcase for about 6 months now, and flip back often to keep focused on how I want to get to be in my life. That being said- I think that most of the reviews here were probably written within the first few weeks, if not days, of reading the book- while still in the 'holy cow- there IS hope! jeeez -That would be PERFECT!' state of psuedo-enlightenment that grabs you when you first read the book. However, in my experience that initial high found in the act of buying your new automatic labeller, or the stapler you can 'bang with your fist' is quickly diluted when it becomes clear that these symbols of a fresh start and getting it all sorted by 'starting over from scratch' are just that- symbols. Granted, things like the '2-minute rule' and applying the 'whats the next action' question to everything on the front end make an instantaneous, if measured, difference- but as Mr. Allen mentions in this book (I think, or maybe its in the follow up book 'Ready for Anything'- also good, but not on the scale of GTD) , it can take up to 2 YEARS for someone to really 'get' the system and implement it fully. Which brings me to my point; If you can look at yourself and you simply know, without exaggeration, that you are the busiest, most overwhelmed person you've ever known- then be forewarned; do not get swept away in that initial burst of optimism- because you will be disappointed when you realize that the amount of work and thought needed to effectively implement this methodology is actually quite similar in scope to all those other overwhelming and out of control projects on your (amorphously undo-able) To-Do List!-i.e. buying a 'bang-able' stapler only goes so far.. I didnt expect it would be as hard as it has been to fully apply the techniques in this book to my work/life. Looking back now, judging that Im now about 1/4 of the way to full integration of this methodology-(by my reckoning)- frankly it would have taken me the better part of 20-30 solid days just to get my office and work obligations fully collected and 'processed'. I was frequently frustrated byt the time it was taking, got soured on the whole idea, and often despaired of ever seeing real change. One thing is that it takes time, and a LOT of careful thinking just to figure out how to break your work down into the sections that this methodology requires. First you have to find some sort of permanent structure into which to sort all your incoming stuff; which requires much more time and effort and refinement than I ever expected. Several times I found myself peeling my nice new clearly-legible AutoLabeler labels from my newly assembled binder 'Project Support; African Markets' or whatever, and having to re-structure, and refile the contents all over again- but now separately into 2 folders with nice new AutoLabels for 'Transmission & Distribtuion Projects' and 'Natural Resource and Generation Projects' or what not- it may not sound like much, but the 2 or 3 hours this takes is an enormous chunk of time in which emails are piling- it can really get to you about the 3rd time you realize that the structure you thought was a pretty good fit for your work just turns out to be ..not. However, the methodology is Sound- you can see it when you read it- I dont see what those people that pooh-pooh the concepts as being 'mere common sense overly verbalized with jargon' are upset/talking about; this book is clear and concise. i.e. under the project 'Pay Taxes', put the Next Action of 'download tax instructions from IRS website' on the Next Action list titled '(When)Online'- so that the next time you are wasting time on the web writing lame book reviews, you can look at your 'online' list and say- hey! Ill download that thing while Im typing!- voile! improved efficiency!. Well thats my rant- I pity you if you have read this far- but please know that I never would have been able to rant like this 6 months ago-wouldnt have had the time. Buy the book- its a great book.